Who loves chocolate and supporting their community; the team at Davidsons sure does! Did you know that over 50,000 children were admitted to The Royal Children’s Hospital in Melbourne last year and over 86,000 children were treated in emergency? That’s in addition to over 338,000 children treated at the hospital’s specialist clinics. 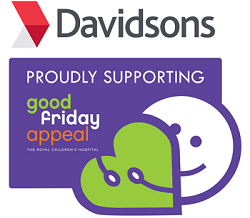 Davidsons will be raising funds again this year by holdings its Annual Good Friday Appeal raffle. All monies raised will be donated to the Royal Children’s Hospital which will help deliver the best possible care to patients and their families.